Motoki does well in Kisei knock-out: The first game in the irregular knock-out among the various league winners in the 42nd Kisei tournament was played on October 2. Motoki Katsuya 8P, winner of the C League, beat Yo Seiki (Yu Chengqi) 7P, winner of the play-off between the winners of the two B Leagues. Motoki followed up this success by beating the winner of the A League, Takao Shinji Meijin, on October 12. Taking black, Motoki won by resignation. Next, he will meet the second-place-getter in the S League, Yamashita Keigo. Chinese pair wins world championship: The second part of the Pair Go World Championship 2017 was held at the Cerulean Tower Tokyu Hotel in Shibuya, Tokyo, on October 5. 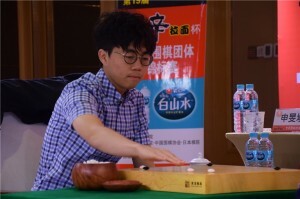 The winning pair in the Stars Tournament, held at the same venue on August 12 and 13, that is, Xie Yimin 6P and Iyama Yuta 9P, representing Japan, met the reigning Pair Go world champions, Yu Zhiying 5P and Ke Jie 9P of China, in the Masters Match. The Chinese pair earned their title in the Pair Go World Cup 2016 Tokyo. Playing white, Yu and Ke defended their title, forcing Xie and Iyama to resign after 198 moves. Like the final in the August event, the game was played in the Noh Theater in the basement of the hotel. 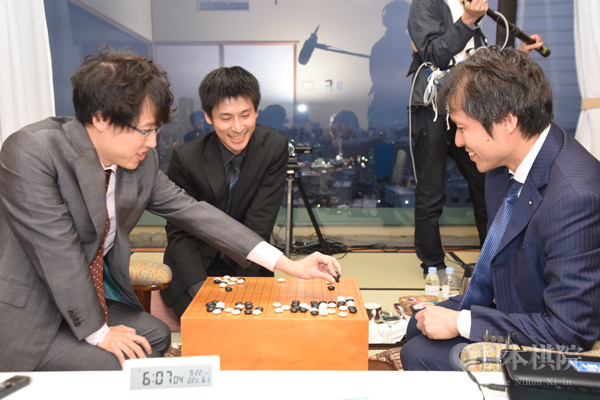 A unique event, the Go AI Research and Goodwill Game by the Pair Go Format, was held on the previous day. Xie, Iyama and the program DeepZenGo were matched against Yu, Ke and DeepZenGo. 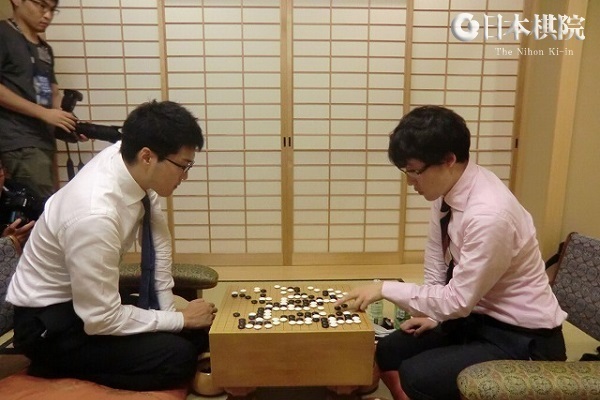 To fit the Pair Go format, the human players on each team played as one member of the pair with the AI program; they were free to consult each other and together played every second move for their side. This was a lighthearted event, with the players occasionally bursting into laughter. Xie, of course, could also follow what the Chinese players were saying, which she said made the game even more fun. Just for the record, this game was also won by the Chinese pair. New Honinbo league starts: The first two games in the 73rd Honinbo League were played on October 5. Yamashita Keigo 9P (B) beat Kobayashi Satoru 9P by resig. and Motoki Katsuya 8P (W) beat Shibano Toramaru 7P, also by resig. So far, October has been a good month for Motoki, the previous Honinbo challenger. Korea stars in Nongshim Cup: The opening round of the 19th Nong Shim Spicy Noodles Cup was held in Shenyang City in Liaoning Province in China from September 19 to 22. It was a triumph for Shin Minjun 6P (right) of Korea, who won all four games in this round. He showed that there’s more than one strong player named Shin in Korea. He was born on Jan. 11, 1999 in Busan, became a professional in 2012 and reached 4-dan in 2016. In the same year, he won the 4th King of the New Stars title, which earned him promotion to 5-dan. He was promoted to 6-dan earlier this year. In the Korean qualifying tournament to choose the team for this tournament, he defeated his teacher, Lee Sedol. In the first Nongshim game, he defeated the player, Fan Tingyu, who won seven games in a row in the previous Nongshim Cup. Game One (Sept. 19). Shin (W) beat Fan Tingyu 9P (China) by 3.5 points. Game Two (Sept. 20). Shin (B) beat Yo Seiki (Yu Chengqi) 7P (Japan) by resig. Game Three (Sept. 21). Shin (B) beat Zhou Ruiyang 9P (China) by resig. Game Four (Sept. 22). Shin (W) beat Kyo Kagen (Xu Jiayuan) 7P (Japan) by resig. Time allowance is one hour per player followed by byo-yomi of one minute per move. The remaining members of the Japanese team are Iyama Yuta, Yamashita Keigo, and Ichiriki Ryo. Round Two will be played in Busan, Korea, in November, and Round Three in Shanghai in February. As promised, here is some more detail about the 4th game of the current Meijin title match, played on October 2 and 3. Takao Shinji, the challenger, had black. He slipped up in the opening, neglecting to defend a large group because he overlooked a sequence White had to put it into ko. In effect, he had to give White a free move elsewhere when he played an extra move to secure life. That left him a tempo behind in the game, but he played on tenaciously and succeeded in creating complications by leading the game into a large-scale fight. He then played a clever move with Black 101 that seemed to turn the tables in the fight; if White made the “usual” answer, Black had a clever tesuji with move 16 in an unplayed continuation. “Unplayed,” because Iyama came up with a brilliant counter-intuitive combination that enabled him to capture the key stones in the fight at the cost of a couple of sacrifice stones. That gave him the lead. Takao fought on for another 50 moves or so, but was unable to catch up. Iyama even rubbed salt in the wound by making use of the “sacrifice” stones in a later fight. Takao resigned after White 164. The fifth game is already being played on October 16 and 17. It is Takao’s first kadoban, so the second grand slam in Japanese go could be imminent. Iyama takes lead in Meijin title match: The third game of the 42nd Meijin title match between Takao Shinji Meijin and Iyama Yuta was held at the Kiyomi Mountain Villa: Hana-jukai, Takamatsu City, Kagawa Prefecture on September 21 and 22 . The match was level at 1-all, so this was a key game: the winner would gain momentum, and the loser would come under pressure. Fighting started early in the top right corner, but Iyama, who had black, surprised the players following the game with a tenuki with 17. After playing just two moves in the bottom left corner, he came back to the first fight. The spectators (via a TV monitor) couldn’t work out the point of the two moves in the bottom left, but, after some hard thought, Cho U 9P, the Asahi Newspaper commentator on the game, worked out that Iyama’s aim was to prevent Takao from playing a sequence that ended up in a ladder if Black kept playing the most aggressive moves. His moves at 17 and 19 acted as a ladder breaker. Takao modified his play and ended up taking profit in the top right while giving Iyama influence. Both sides continued to play aggressively, making the game one complicated fight after another. After a ko fight won by Takao in the bottom left, he invaded Black’s bottom right territory and succeeded in living after fighting a number of kos. Again, Iyama took compensation with outside influence. More fighting followed, and up to move 145 the game was played at a very high level, with neither side making a mistake and the players agreeing in their analysis, but with 146 Takao made a slack move. It was slack presumably because it was purely territorial, saving some cut-off stones. Instead, he should have reinforced his sole remaining weak group. By harassing it, Iyama was able to expand his centre moyo, and there was no way for Takao to reduce it sufficiently. He resigned after Black 241. After the game, Takao commented that he was not too worried about falling behind because he felt he was playing well – putting aside just one move. The fourth game was played at the Inn Kaiseki Notoya in Komatsu City, Ishikawa Prefecture, on October 2 and 3. Taking white, Iyama secured a resignation after 164 moves. I will give some more details about the game when available. Takao faces his first kadoban on October 16 and 17. Fujisawa Rina does well in Gosei tournament: The first ambition of young players is to reach the Main Tournament of the top seven tournaments. This is the final section of a tournament that either produces a challenger or provides entry into leagues. Usually, it more or less means reaching the best 16 or the best 32, but the number may vary. In the previous Judan tournament it was the best 16, but in the previous Gosei tournament the best 29. These are all knock-outs, so in the Gosei some players were seeded into the second round. Historically, women players have not done very well gaining entry to main tournaments, with eight women achieving this goal nine times. (For those interested, the list goes: Honda Sachiko, Kobayashi Reiko, Kusunoki Teruko, Ogawa Tomoko, Yos hida Mika, Kobayashi Izumi twice, Kato Keiko, and Kuwabara Yoko.) In a game played on September 21, Fujisawa Rina 3P (right) became the ninth woman, reaching the Main Tournament of the Gosei tournament. The last time this happened was nine years ago (Kato and Kuwabara both qualified in the Tengen). None of her predecessors won a game, so Fujisawa has a chance to set a record for women. Xie makes good start in Women’s Honinbo: The first game of the 36th Women’s Honinbo title match, in which Xie Yimin (left) is challenging Fujisawa Rina, was held at the Kashoen inn in Hanamaki City, Iwate Prefecture on September 27. 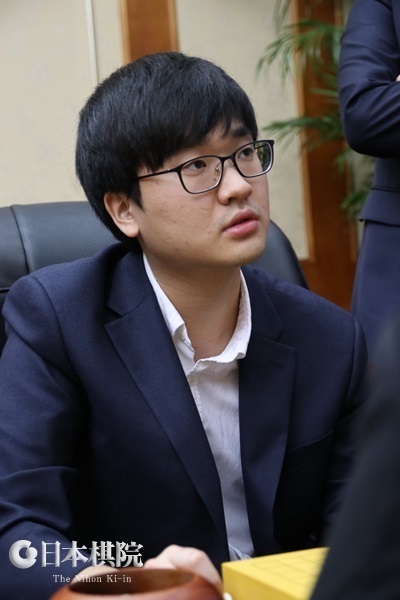 Taking black, Xie secured a resignation after 257 moves. Shibano wins King of the New Stars: The second game of the 42nd King of the New Stars title was held at the Nihon Ki-in headquarters in Tokyo on October 2. Shibano Toramaru 7P (black) beat Son Makoto 5P by resig. Often success in this junior tournament is a good omen for future success, but in Shibano’s case that success is already coming. 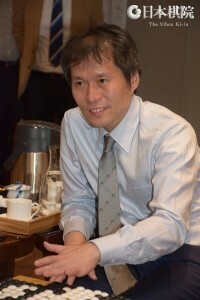 As described in recent reports, he won the Ryusei title and a seat in the new Honinbo League. Since the Ryusei win earned him promotion to 7-dan (if he hadn’t won it, he would have got the promotion from his Honinbo success), he is not eligible to play in the King of the New Stars tournament again. First prize is worth two million yen (a little over $18,000). 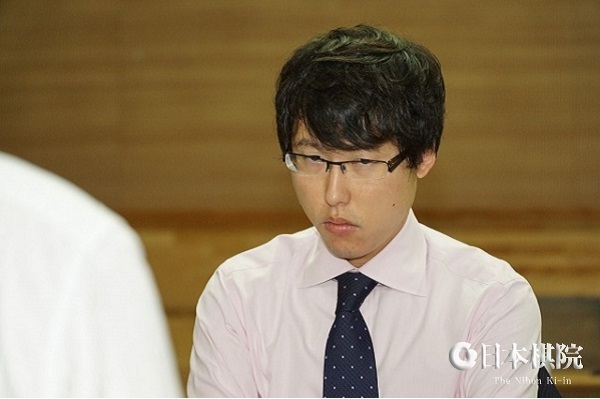 (Sept. 15): Round 1, Game 1) Lee Sedol 9P (Korea) beat Iyama Yuta 9P (Japan) by resig. Game 2) Ichiriki Ryo 7P (Japan) (W) beat Zhang Tao 6P (China) by resig. (Sept. 16): Round 1, Game 3) Na Hyeon 8P (Korea) (W) beat Li Jianhao 7P (China) by 4.5 points. Semifinal 1) Lee Sedol (B) beat Li Qincheng 9P (China, 2016 winner) by resig. (Sept. 17): Semifinal 2) Na (B) beat Ichiriki by resig. 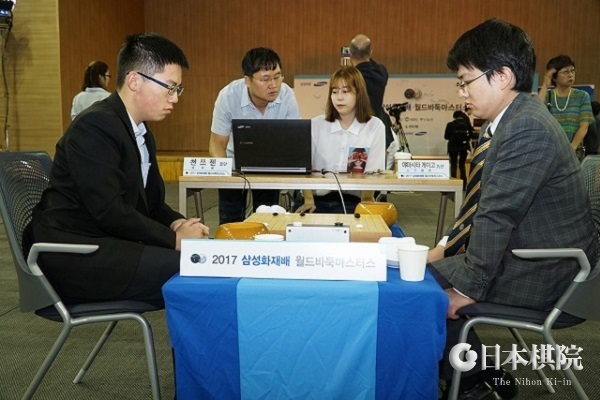 Final: Na (B, at right) beat Lee Sedol by resig. after 184 moves. This is Na’s first win in this tournament. Lee missed out on a fifth win. Just for the record, China has won this tournament eight times to ten times each for Japan and Korea. First prize is 2,500,000 yen (about $22,700). King of the New Stars: The first game of the 42nd King of the New Stars best-of-three title match was held at the Tokyo headquarters of the Nihon Ki-in on September 18. Shibano Toramaru 7P (W, left) beat Son Makoto 5P by resig. The second game will be played at the same venue on October 2. 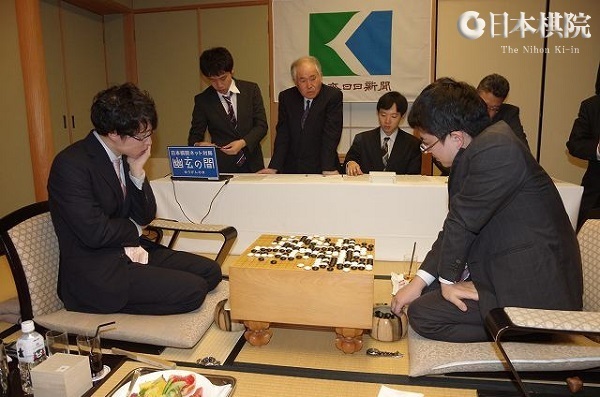 Iyama evens Meijin Score: The second game of the 42nd Meijin title match was held at the Hotel Chinzanso Tokyo, which is located in Bunkyo Ward, on September 12 and 13. The highlight of the game was a fierce fight that started on the first day. A large trade followed in which Iyama (W, right) took most of the top and Takao threatened to take most of the bottom. However, his moyo was too big. Iyama succeeded in breaking into it, so Takao resigned after White 146. This evens the score at 1-1. The third game will be played on September 21 and 22. Iyama and Yamashita advance in Samsung Cup: The opening round of the 22nd Samsung Cup (officially, the Samsung Fire & Marine Insurance Cup World Go Masters) was held at the Samsung Fire & Marine Insurance Global Campus in Goyang City, Gyeonggi Province on September 5 to 7. The “campus” is actually one of a number of training camps the Samsung group owns, and facilities rival those of a five-star hotel. The 1st round takes three days to play as it consists of eight double-elimination mini-leagues. There are four players in each league, and the top two players advance to the round of 16. The condition is two wins, which means a score of 2-0 or 2-1. Two Japanese players, Iyama Yuta and Yamashita Keigo 9P, scored 2-1 and made it to the next round. 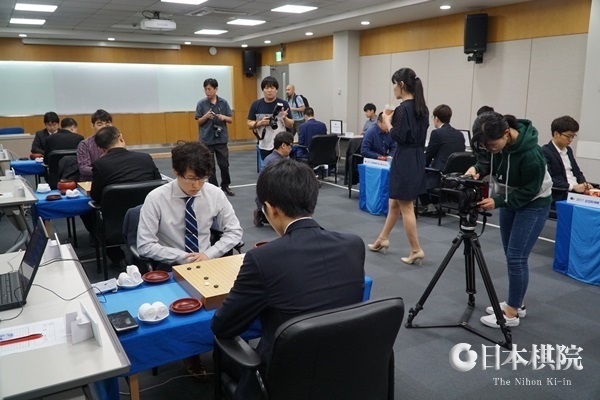 They were joined by seven Korean and seven Chinese players, including Ke Jie 9P and Lee Sedol 9P. The third Japanese representative, Komatsu Hideki 9P, who won a seat in the qualifying section for senior players, was eliminated with 1-2. The next round will be held on September 25. Kisei leagues completed: The last games in the S League of the 42nd Kisei tournament were held recently. On September 7, Ichiriki Ryo 7P (W) beat Kono Rin 9P by resig. and Cho U 9P (B) beat So Yokoku 9P by resig. Ichiriki had already won the league in the previous round, but making a clean sweep of the league was undoubtedly satisfying. Cho’s win made sure that he kept his place. An important game was held on September 9 between Yamashita Keigo 9P and Murakawa Daisuke 8P. The winner would take second place in the league and, more important, gain a place in the irregular knockout to decide the challenger; the loser would lose his league place and drop to the A League. Taking black, Yamashita (right) won by 2.5 points. The final order in the S League is: 1st, Ichiriki, 5-0; 2nd, Yamashita, 3-2; 3rd, Cho U, 3-2; 4th, Kono Rin, 2-3; dropping out: Murakawa on 2-2 and So on 0-5. Two key games in the A League were played on September 7. Takao Shinji 9P and Kyo Kagen (Xu Jiayuan in Pinyin) 4P were tied on 5-1. However, Takao was ranked number one and Kyo, as a newcomer to the league, was equal last, so to win the league Kyo needed not only to win his game but also to have Takao lose. The latter just made it: taking black, he eked out a half-point win over Yoda Norimoto 9P, so he won the league. Kyo (B) beat Hane Naoki 9P by resig. Although he missed qualifying for the knockout, Kyo earned a consolation prize: promotion to the S League. The top two players go up, so he will be joined by Takao – except if Takao becomes the challenger and wins the Kisei title, in which case Iyama would join Kyo in the S League. The S League promotion carried with it a promotion to 7-dan. The play-off between the winners of the two B Leagues was held on September 14. Yo Seiki 7P (W), winner of B2, beat Shida Tatsuya 7P, winner of B1, by resig. This is how the final knockout looks: C League winner Motoki Katsuya 8P vs. Yo Seiki; the winner to play Takao; the winner to play Yamashita; the winner to meet Ichiriki in the final “best-of-three”. The quotes are there because three games will never be played. Ichiriki starts with a one-win advantage, so he needs only one win; his opponent can’t drop a game, so he has to win two straight. That won’t be easy: on current form, Ichiriki could claim to be the number three player after Iyama and Takao. Takao makes good start in Meijin title match: The first game of the 42nd Meijin title match was held at the Conrad Osaka, a Western-style hotel in Kita Ward, on August 30 and 31. Unusually for a Japanese title game, the players were seated at a table. The big interest in this series is whether Iyama will achieve his second grand slam. He has kept all his other six titles, usually winning the title matches comfortably, but there is no guarantee he will get another chance like this. His opponent, Takao Shinji Meijin (right), will be just as determined to defend his title, one big factor in his motivation being his age: having turned 40, he can’t count on many more chances to win a big-three title. Iyama (left) drew black in the nigiri. Not surprisingly, the game featured continuous fighting that got more and more complicated as the game went on, making it impossible to summarize it. Takao made a very skillful sacrifice that seemed to give him the initiative in the center. He successfully parried desperate attempts by Iyama to catch up and ended up with a half-point win. The second game will be played on September 12 and 13. Women’s Meijin tournament gives up league: The pairings for the 30th Women’s Meijin tournament were published in the latest Weekly Go issue, and it was announced that the seven-player league system adopted for the 21st to the 29th terms had been abolished. The final section of the tournament will revert to the standard knock-out format with 16 participants. The reason is that will give more players a chance to become the challenger. Xie to challenge for Women’s Honinbo: She may have lost some titles to Fujisawa Rina recently, but there is no doubt that Xie Yimin (reverting to Pinyin spelling) remains one of the top two women players in Japan. 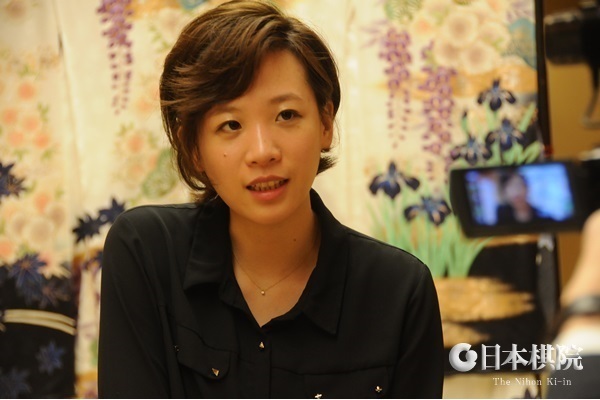 In the final of the 36th Women’s Honinbo tournament, held on August 17, Xie (W) beat Yoshihara Yukari 6P by 5.5 points, so she has a chance to wrest back one of her lost titles. The title match starts on September 27 and features the same pairing for three years in a row. Ichiriki to challenge for Oza and Tengen: Ichiriki Ryo made his debut in top-seven title matches when he challenged Iyama Yuta for the Tengen title last year. He won the second game but lost the match 1-3. This year he has earned himself two chances to take revenge. 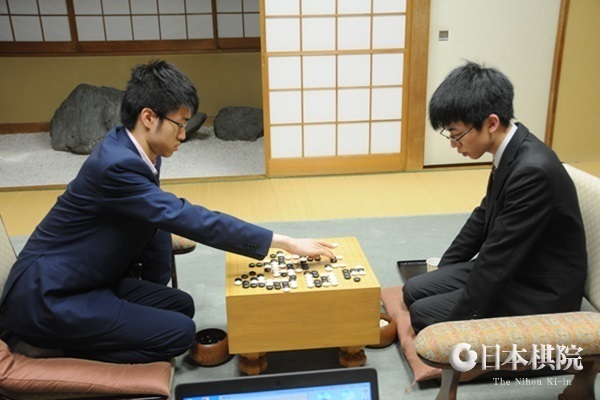 First, in the play-off to decide the challenger for the 65th Oza title, held at the Nihon Ki-in in Tokyo on August 25, Ichiriki (B, at left) beat Shibano Toramaru (right) by 1.5 points. The senior player (Ichiriki turned 20 in June) prevailed over the junior one. If Shibano had won, he would have become the youngest player to challenge for a top-seven title. (By the way, after this result the two shared first place in the most-wins list, Shibano with 33-8 and Ichiriki with 33-9.) The first game of the title match will be played on October 20. 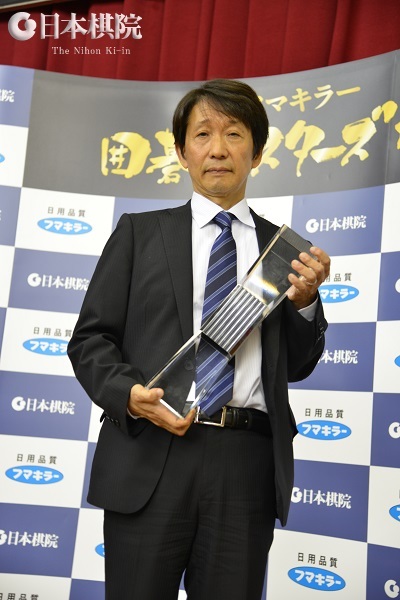 On August 31, the play-off to decide the challenger for the 43rd Tengen title was held at the Nihon Ki-in and it pitted Ichiriki against the 38-year-old Yamashita Keigo. This was the same pairing as last year, and the result was the same, a win for the younger player. Taking black, Ichiriki won by 4.5 points. The first game will be played on October 11. 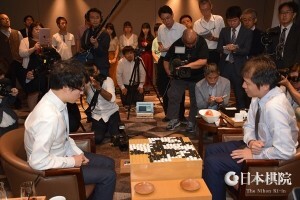 Hsieh and Iyama pair win Pair Go tournament: The Pair Go World Championship Stars Tournament 2017 was held at the Cerulean Tower Tokyu Hotel in Shibuya, Tokyo, on August 12 and 13 and was won by the pair of Hsieh Yimin and Iyama Yuta, representing Japan. 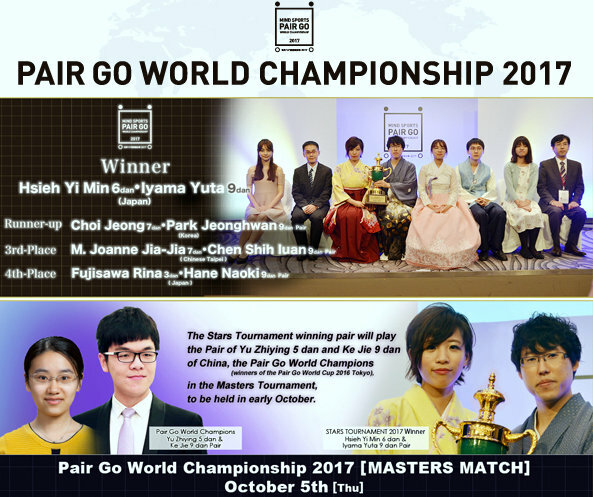 In a sense, this tournament is a successor to the Pair Go World Cup 2016 Tokyo, which was held in Shibuya last year and was a great success with go fans. It is actually in two parts. The first part, the Stars Tournament, was a mini-knockout tournament in which two pairs from Japan and one each from Korea and Chinese Taipei took part. The winners are to play the winning pair from last year’s World Cup in the second part of the tournament, called the Masters Match, in October. The luck of the draw saw the two teams from Japan play each other in the first round. The pair of Hsieh Yimin 6P (spelling is a mixture of two romanization systems but follows the Nihon Ki-in HP) and Iyama Yuta 9P (B) beat the pair of Fujisawa Rina 3Pand Hane Naoki 9P by resig. In the other first-round game, Choi Jeong 7-dan and Park Jeonghwan 9-dan (W) from Korea beat Hei Jia-jia 7P (also known as Joanne Missingham) and Chen Shih-yuan 9P of Chinese Taipei by resig. In the final, Hsieh and Iyama (B) beat Choi and Park by resig. First prize was ten million yen. Hsieh and Iyama will meet the World Cup-winning pair of Yu Zhiying 5P and Ke Jie 9P in the Masters Match. Hei and Chen (B) beat Fujisawa and Hane by 5.5 points in the play-off for 3rd place. Like last year, a competition in solving life-and-death problems was also held. The four human pairs competed against the Pandanet life-and-death AI program Panda Sensei in solving five problems. The time allowed for the super-difficult problems was ten minutes each. Panda Sensei won easily, like last year, with four correct solutions in the fastest time. Choe and Park came second, with one correct solution, and Hsieh and Iyama third (they solved the same problem, but the Korea pair was a little faster). What is notable, however, is that Panda Sensei was unable to solve one problem. Ichiriki wins Kisei S League: Two games in the S League of the 42nd Kisei tournament were held on August 10. Yamashita Keigo 9P (W) beat Kono Rin 9P by resig. and Murakawa Daisuke 8P (W) beat Cho U 9P, also by resig. As a result, there were four players on 2-2, namely, Kono, Yamashita, Murakawa, and Cho U, which meant that Ichiriki Ryo 7P, on 4-0, became unbeatable with one round still to be played. The other league member is So Yokoku 9P, who is on 0-4. Ichiriki secures a place in the play-off to decide the challenger; he needs only one game in the best-of-three, so he has a good chance of meeting Iyama in the title match. Youngest member ever of Honinbo League: The four vacant places in the 73rd Honinbo League have been decided. Two of the final play-offs were held on August 17. In one, Kobayashi Satoru 9P (B) beat Terayama Rei 5P by resig. ; in the other, Ida Atsushi 8P (W) beat Ichiriki Ryo 7P by half a point. Kobayashi will play in his fifth Honinbo League and Ida in his fourth. The third place was decided on August 31. Playing black, Yo Seiki (Yu Chengqi) 7P beat Yoda Norimoto 9P by 2.5 points. This will be Yo’s fourth Honinbo League. 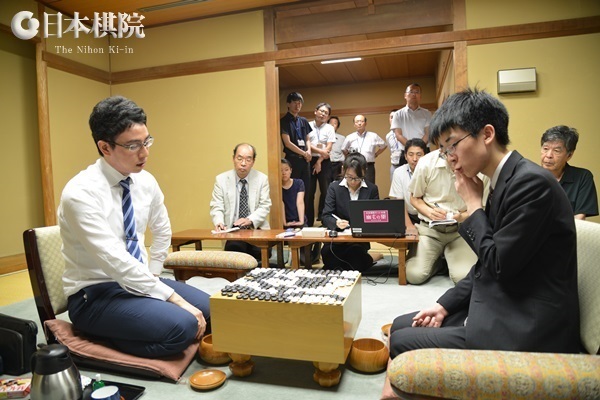 The last place was decided on September 4, when Shibano Toramaru 7P (right) beat Kyo Kagen (Xu Jiayuan) 4P (game details not yet available to me). At 17 years nine months, Shibano is the youngest player to win a seat in the Honinbo League. He has been a pro for three years exactly, so he is also the quickest. (The record for all leagues is held by Ichiriki Ryo, who got into the Kisei League aged 16 years nine months. The new league starts in October; many fans will be looking forward to Shibano’s debut, as he is not only the strongest high-teen player in Japan but also has an aggressive, individualistic style. Iyama sweeps Meijin League: The final round of the 42nd Meijin League was held on August 3. The challenger had already been decided in the previous round, so the “grand finale” of the league may have been lacking in drama, but for the players hovering between demotion and retaining their league places, there would have been plenty of suspense in the day’s play. 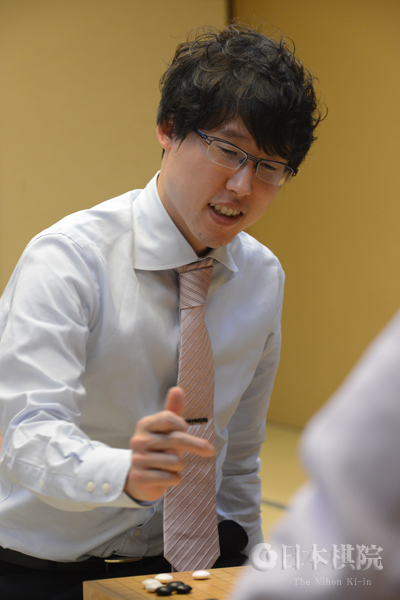 In his final game, Iyama Yuta was matched against Yo Seiki 7P, who needed to beat him to retain his place. As it turned out, Iyama demonstrated overwhelming strength in their game and won easily, so he finished with a perfect 8-0 record and Yo, who scored 3-5, will have to start over again in the final preliminary round. Iyama finished three points clear of the field. Usually the margin is just one point or, occasionally two; I can’t recall anyone else winning by three points. What’s more, he had already established this lead in the second-last round. Iyama is really head and shoulders ahead of other players in Japan. What is striking in the Meijin League chart is how little the status quo changed: the new players are out and there’s only one change in the placings from 1 to 6. The first game of the match with Takao Shinji Meijin will be played on August 30 and 31. Final-round results: Iyama (B) beat Yo by resig. ; Cho U 9P (B) beat Ko Iso 8P by resig. ; Kono Rin 9P (W) beat Sakai Hideyuki 8P by resig. ; Hane Naoki 9P (B) beat Murakawa Daisuke 8P by resig. Players to drop out are Hane, Sakai, and Yo. 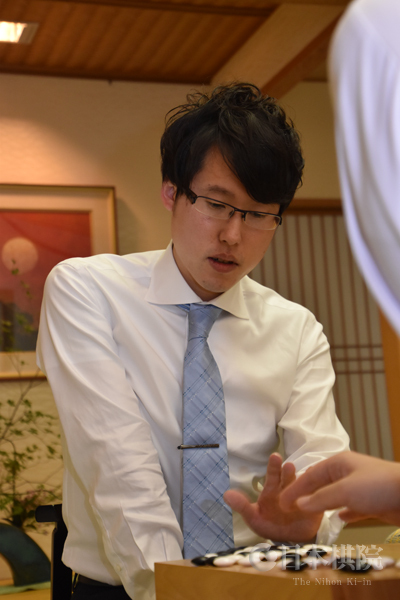 Iyama’s winning streak ends: In a game in the Agon Kiriyama Cup played on July 31, Iyama Yuta lost by 1.5 points to Yamada Kimio 9P (B) so his winning streak came to an end on 16. Ichiriki maintains lead in Kisei S League: One game in the S League of the 62nd Kisei tournament was played on August 3. Ichiriki Ryo 7P (W) beat So Yokoku 9P by resig. That took Ichiriki to 4-0 and continued the sole lead he has enjoyed since the second round. 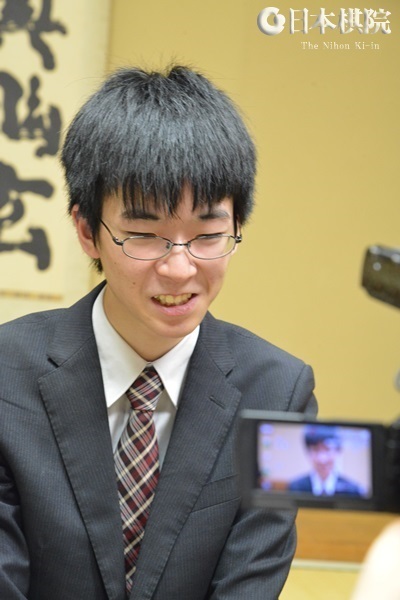 In the fifth and final round he will play Kono Rin, who, on 2-1, is the only other player still in the running. League ranks will affect the outcome, as there is no play-off in the Kisei leagues. If Kono beats Yamashita Keigo in this round, then beats Ichiriki in the final round, then, as the number one player, he will win the league. At this point, Cho U also has only one loss―he is also on 2-1―but, at #5, he is outranked by both Kono and Ichiriki (#4). 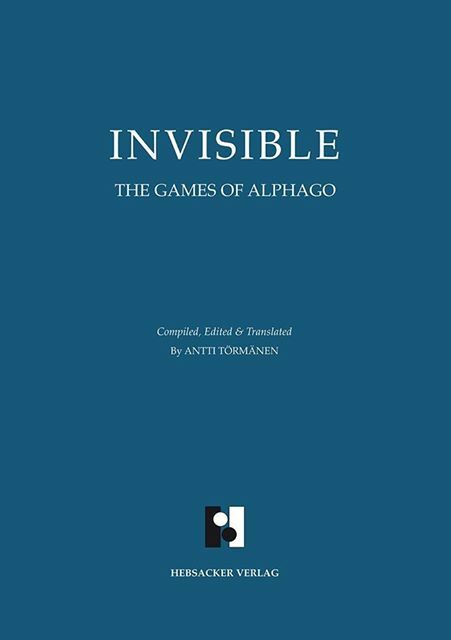 AlphaGo book recommendation: In a recent edition of the E-Journal (“Invisible” collects 78 AlphaGo games), there appeared a notice about the publication of “Invisible,” the first book devoted to the games between the AI program AlphaGo and human players. I would like to recommend the book. Its core is the 60-game winning streak set up by AlphaGo, playing as Master, but it also includes other games played at the Go Summit in China. I had the opportunity to proofread about half of these games before publication and it was a real pleasure. Apart from the extraordinary interest of the games themselves, I enjoyed the lucid and instructive presentation by the author, Antti Tormanen. The layout is excellent and the commentaries are clear and accessible. They focus on the innovations of AlphaGo and its dramatic divergences from established professional theory. To look at it another way, these elements of the games constitute the contributions AlphaGo can make to go theory, though it may be a while before its theoretical advances can be fully digested by mere mortals. This book makes a good start in print to that process. In passing, here are two points, among others, that struck me. Very early in the game, AlphaGo plays moves based on its ability to calculate. For example, it plays reducing moves or makes sacrifices that it’s difficult to see human players emulating―they can imitate the moves, but can they make calculations extending to the end of the game while still in the opening? Secondly, it has no ego: it’s content to win by one point and sees no need to crush the opponent. Here, perhaps, humans may not wish to emulate it. 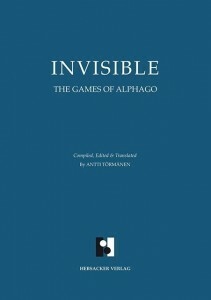 A pdf version of Invisible is available online here or email info@hebsacker-verlag.de for details on the hardcover version. 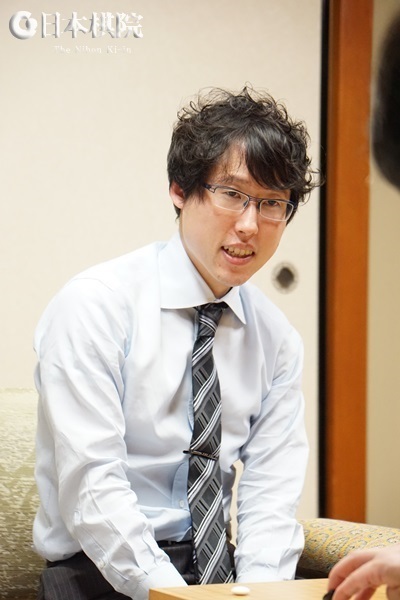 Iyama defends Gosei title, becomes Meijin challenger, extends winning streak: Last week Iyama Yuta extended a winning streak he started on April 13 to 16 games. That indicates that this report won’t include any Iyama failures. 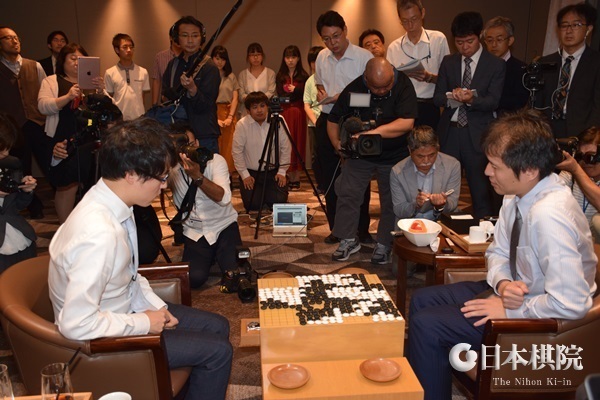 The second game of the 42nd Gosei title match was held in the Miyajima Hotel Makoto in Hatsukaichi City, Hiroshima Prefecture, on July 19. Taking black, Iyama played “steadily” and secured a resignation after 145 moves. “Steadily” was the word used by the Go Weekly reporter, but to me the game seemed very complicated. In a kind of trade, Iyama gave up a large group for the chance to attack and eventually kill a big group and a small one. Having lost the first two games, Yamashita Keigo, the challenger, was now faced with a kadoban. The third game was played at the Hotel Nikko Kumamoto in Kumamoto City, Kumamoto Prefecture, on July 25. 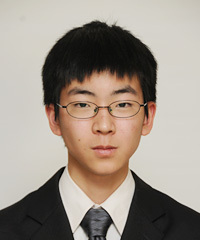 Playing white, Iyama forced Yamashita to resign after 206 moves and defended his title with straight wins. This was another game in which fierce fighting started early and spilled all over the board. Yamashita pushed Iyama hard but was unable to prevail. This is Iyama’s sixth successive Gosei title, equally the Gosei record set by Otake Hideo and Kobayashi Koichi, and his 45th overall. First prize is 8,000,000 yen (at 110.63 yen to the dollar, about $72,313). On July 28, Iyama met Murakawa Daisuke in the eighth round of the 42nd Meijin League (left). The game was played at the Kansai Headquarters of the Nihon Ki-in in Osaka. Iyama had won all his games so far and was leading the league on 6-0. On 4-2, Murakawa was the only other player still in the running with Iyama, but he needed to win his final two games and not only beat Iyama himself, but also have him lose to Yo Seiki in the final round. If that happened, the two would meet in a play-off to decide the challenger. That turned out to be just a dream. Taking black, Murakawa played positively, launching a surprise attack on Iyama early in the game. He seemed to have good momentum in the middle game, but Iyama found a chink in his armor and forced him to resign after 146 moves. Since losing the Meijin title to Takao Shinji about eight months ago, Iyama has done everything right, defending his other six tiles without being put under severe pressure. He can now aim at securing his second grand slam, which would be a first in board games in Japan. Unlike the other rounds, all the games in the final round of the Meijin League are played on the same day, which is August 3 this year. This is to heighten the drama and to encourage fan interest―“If A beats B, and C loses to D, etc.”―but this year the only suspense will be whether or not Iyama finishes the league with a clean slate. The first game of the title match will be played on August 30 and 31. Kobayashi Satoru wins Masters’ Cup: The final of the 7th Fume-killer Igo Masters Cup was held in the TV studio in the basement of the Nihon Ki-in in Tokyo on July 22. After a long (266 moves) and fierce fight, Kobayashi Satoru 9P (B) beat Cho Chikun, Hon. Meijin, by half a point. Kobayashi (right) won this title for the second time after a gap of four years. It is sponsored by an insecticide company and first prize is five million yen. This title is open to players 50 and older who have won a top-seven title. Other senior players who have done well in the prize-money-winning list take part in a qualifying tournament for seats in the main tournament. The time allowance is one hour, with the last five minutes allotted to byo-yomi. There was a standing-room-only crowd at a public commentary given in the large hall on the second floor of the Nihon Ki-in. Shibano wins first title: One of the brightest prospects at the Nihon Ki-in is Shibano Toramaru 3P (left). Commentators have been impressed by his individualistic style and flair for fighting. Shibano won a seat in the final of the 26th Ryusei Cup, where he was matched against another young star, Yo Seiki 7P (Yu Cheng-ch’i) of the Kansai Ki-in. Playing black, Shibano won the game by resignation. He set a couple of speed records. At 17 years eight months, he became the youngest player to win the Ryusei title, breaking the record Ichiriki Ryo set last year of 19 years one month. Second, he was the fastest to win a title in which all professionals could participate, winning the Ryusei two years 11 months after become a professional. 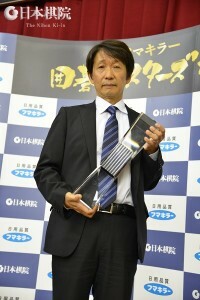 Iyama Yuta set the previous record when he won the 12th Agon Kiriyama Cup three years six months after becoming a pro. This victory also earned Shibano promotion to 7-dan (as of August 1). This set another record, as he was the fastest to 7-dan; the previous record was set by Sakai Hideyuki, who made it in three years four months. Interesting stats: Some interesting players are featuring in the statistical contests this year. Below is the picture as of the end of July. One point of interest is the presence of three female players in the top 12. They are probably getting a bit of a boost from the recent proliferation of women’s titles. Iyama Yuta: 16 (hasn’t lost a game since April 13). Shibano Toramaru also had a wining streak of 16 games that came to an end during July. Correction: In my account of the Senko Cup in my last report, I forgot to mention the location of the venue for the semifinals and finals. They were held at the Akekure inn in the town of Higashi Omi in Shiga Prefecture.